In 2013 The National Exhibition of Wildlife Art (NEWA) celebrated 20 years of excellence in wildlife art, and to mark the occasion held a special Gala Preview and Wildlife Art Auction at Gordale Garden Centre, on the Wirral. The Gala Preview Evening included an auction of original works which were donated by leading artists. The proceeds from the auction were given to: The Wildlife Trust, Chester Zoo, The Woodland Trust, and Tusk to help them support endangered species worldwide. I donated my drawing [link type="Photo" id="11008764"]'Barn Owl Fly-by'[/link] to the auction. In total the auction raised over £11000! Well done everyone involved! 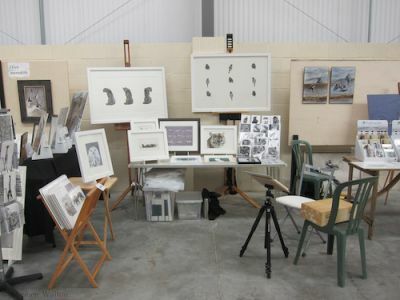 I thoroughly enjoyed the weekend in the Art Marquee. I met some wonderful artists whose work I already greatly admired, and had some great chats with visitors and I hope my advice was helpful to those that asked for some.